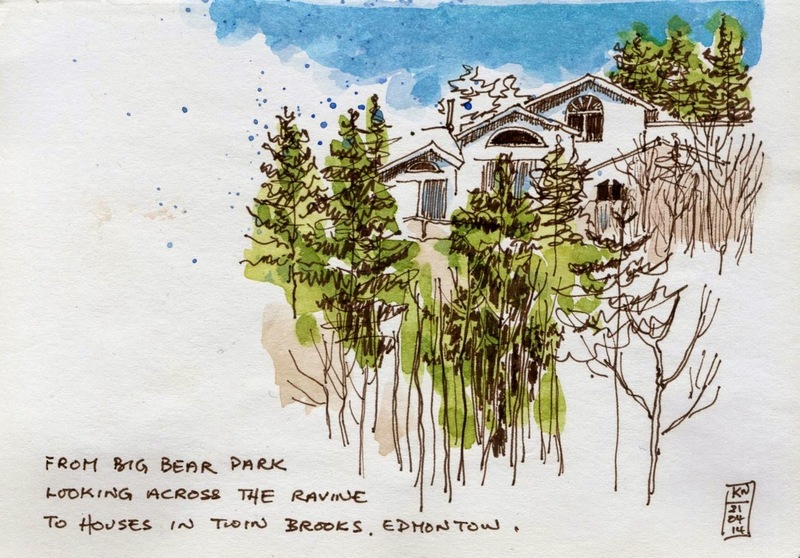 Trying out my Noodler's Polar Brown ink at the May sketchmeet of Urban Sketchers Edmonton. 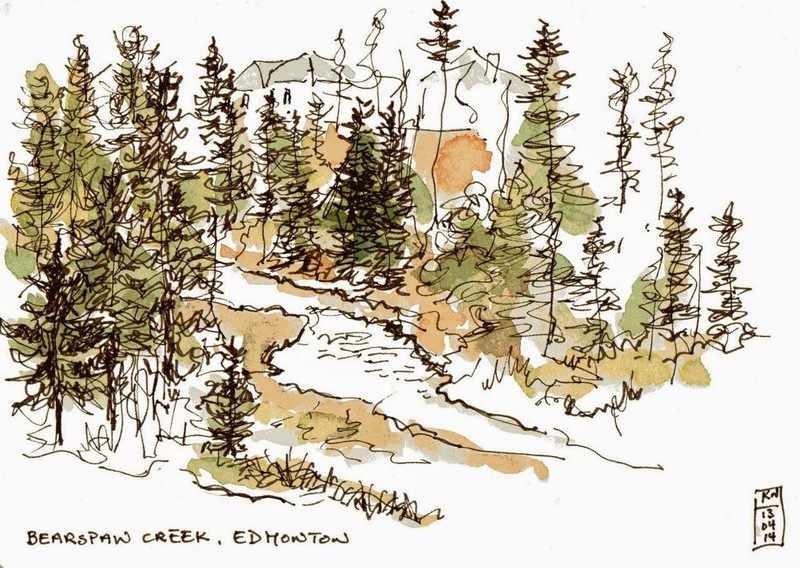 The group went to Jackson Power Gallery to sketch. 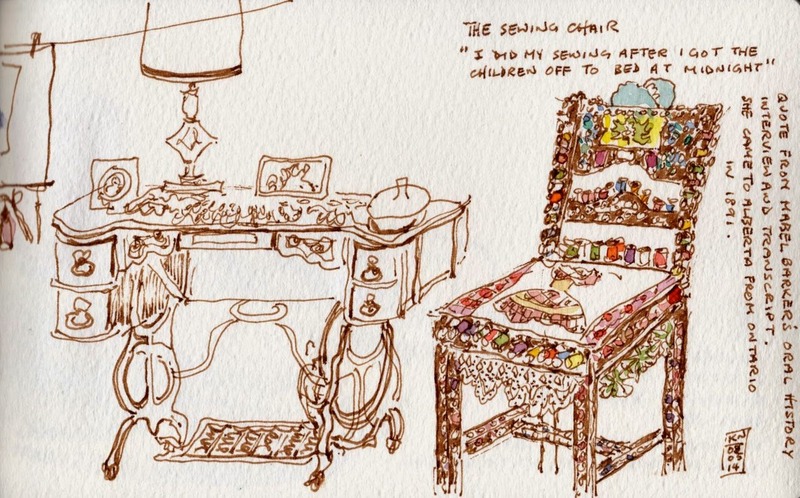 One of our sketchers, Marlena Wyman, had a solo exhibit "The Sisterhood of Longing" in two of the rooms there. 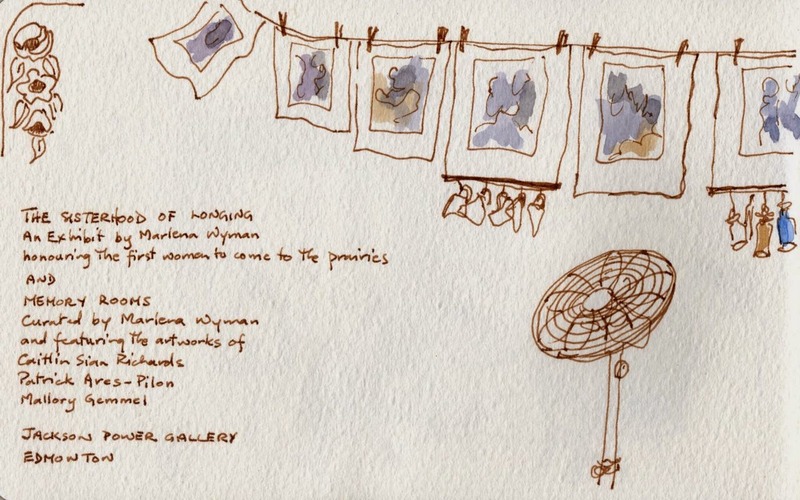 She also curated a concurrent group exhibit "The Memory Rooms" featuring the work of 3 artists (Caitlin Sian Richards, Patrick Arès-Pilon and Mallory Gemmel) in the gallery. There was a brutal cold wind that day so it was a good idea to have chosen an indoor venue. In fact I had to call my spouse who was at home to bring my potted flowering plant indoors. I had heard on the car radio on the way to the sketchmeet that the temperature was falling below zero. This was May! Seven of us adjourned for lunch at the Red Goose restaurant (a sort of vintage Canadian restaurant in the neighbourhood of Hazeldean). The owner is a very pleasant Korean guy who greeted every one who arrived and left with "Happy Day"! 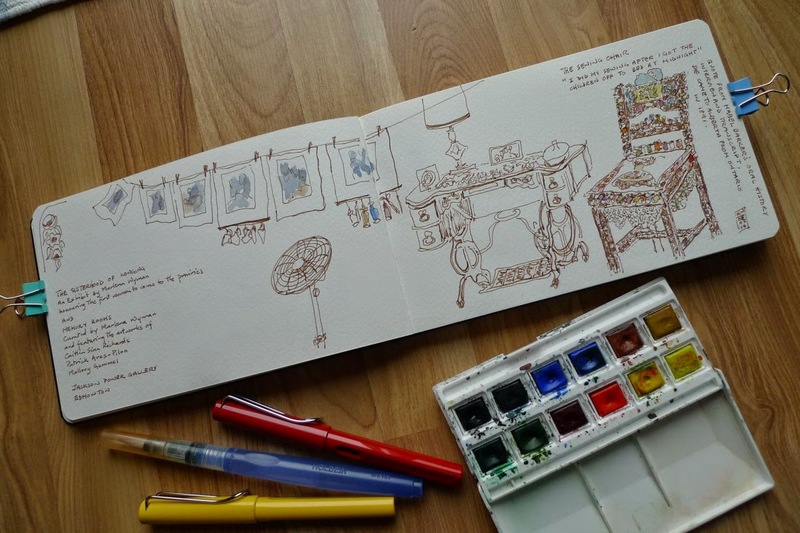 Lamy Pens on Moleskine watercolour sketchbook. Colours were added at home. Went for a walk through the park near my home in April, on one of the few warm days since the winter. From the park you can look down into a ravine. Some trees had been cut down and I could see the stream quite clearly. Water was high from melting snow. 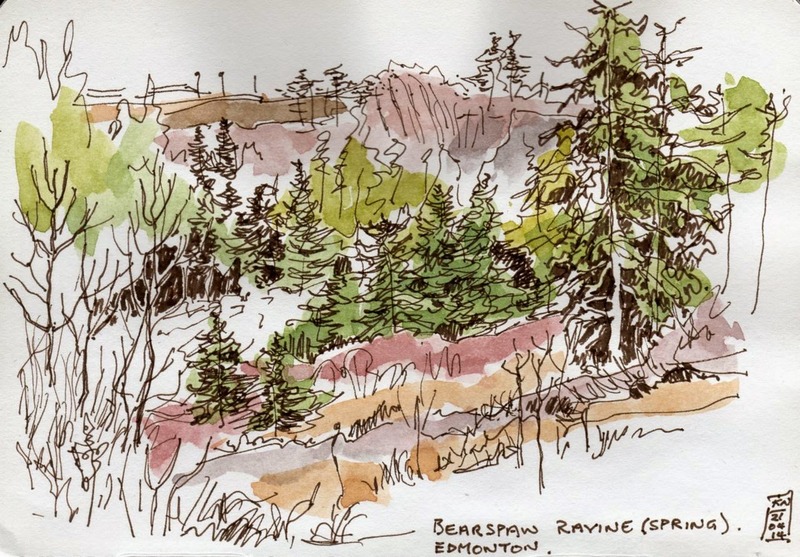 Unfortunately I didn't last long sketching without my glove on (too cold!). Filled in the trees and added colour at home. Good thing I made the most of the 2 warm days over Easter weekend as it turned frigid again soon after. 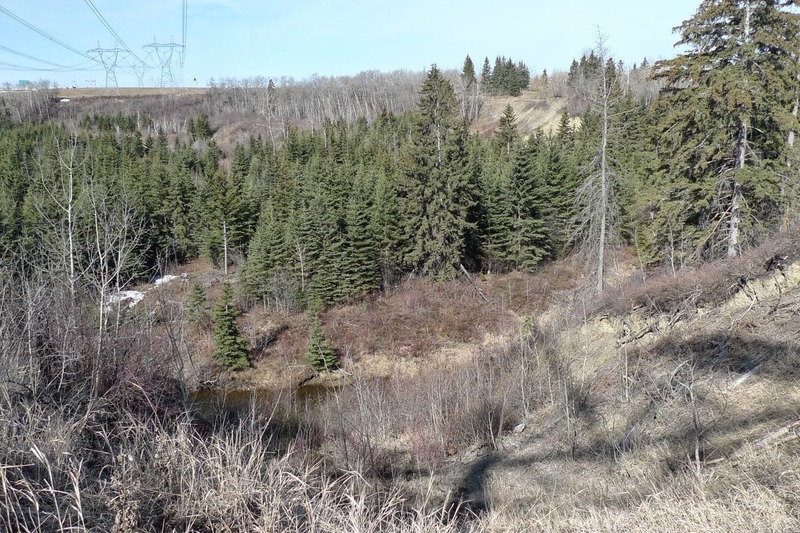 This is a spot in our ravine which is tinged with sadness, it's where we scattered the ashes of our dogs Mitch and Tyler in 2007 and 2008 respectively. Tyler used to rush down the slope, jump into the stream and rush up again. Mitch just used to watch in disgust at her recklessness. They both had long lives and loved this ravine. Still some patches of snow in the shaded areas (Easter weekend 2014). 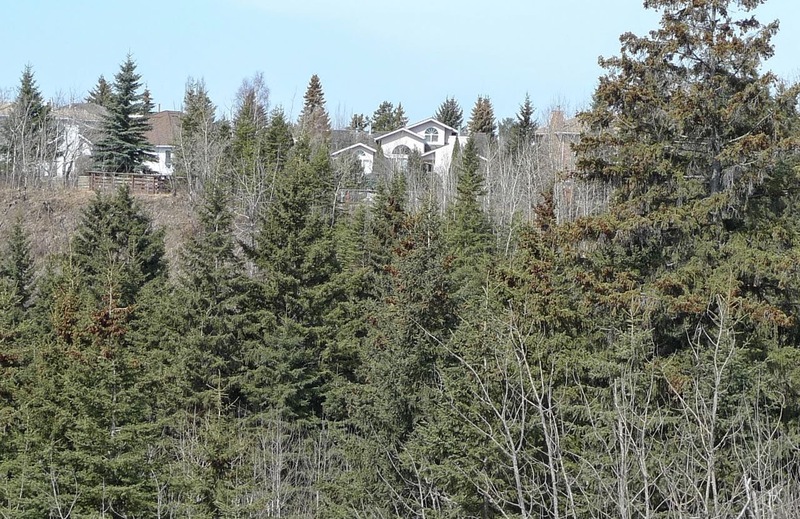 This is looking across another part of the ravine to the houses in neighbouring Twin Brooks. The sketch before adding colour. I spent a lot of time on planes (including 2 long haul flights) this past year. On getting back to Canada from Singapore, just the thought of planes (even a trip to the Edmonton Aviation Museum) was enough to make me feel stressed. The mysterious loss of the Malaysian plane MH 370 has been particularly stomach churning. 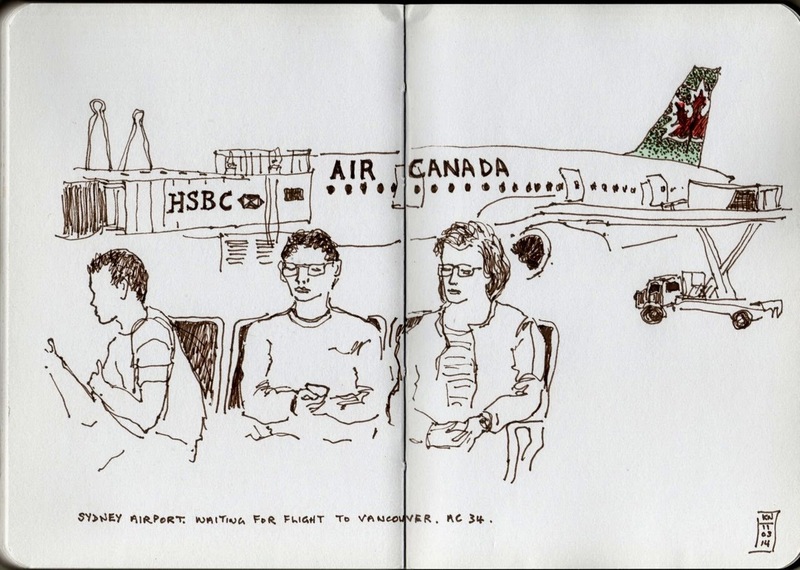 Airports are however good places to sketch and big airliners do give me (an initial) thrill. 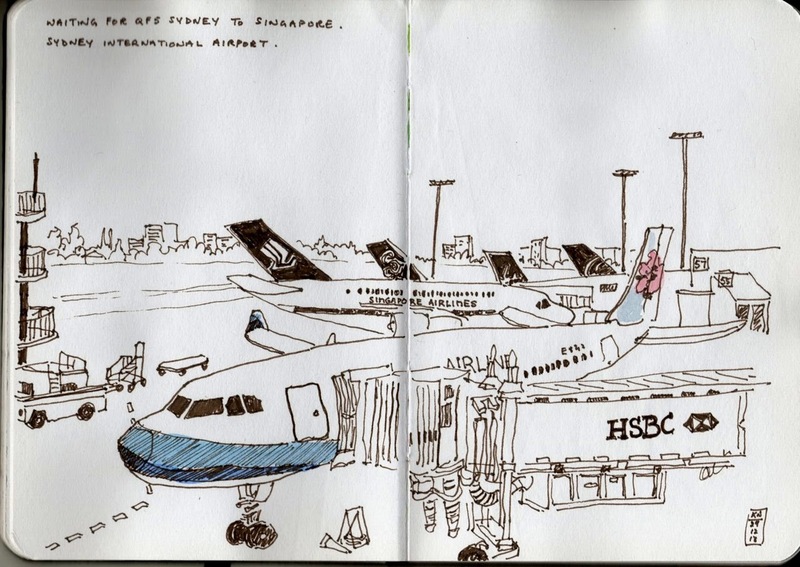 This is one of the last sketches I did before leaving Singapore this year. 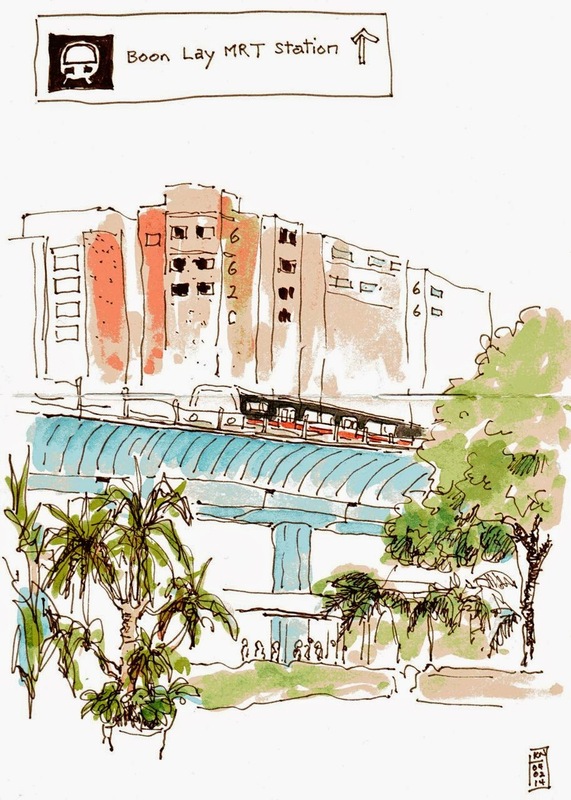 It is of a train approaching Boon Lay MRT station. We often did a grocery shop in one of the supermarkets at the Jurong Point Mall at Boon Lay. I first left the island state 43 years ago as a young adult and except for returning for 4 years in the 1980's have spent my life living in several (mostly Western) countries. I presently live in Canada. I returned regularly to to see family in Singapore over the years and have long felt that I live with a foot in more than one country. 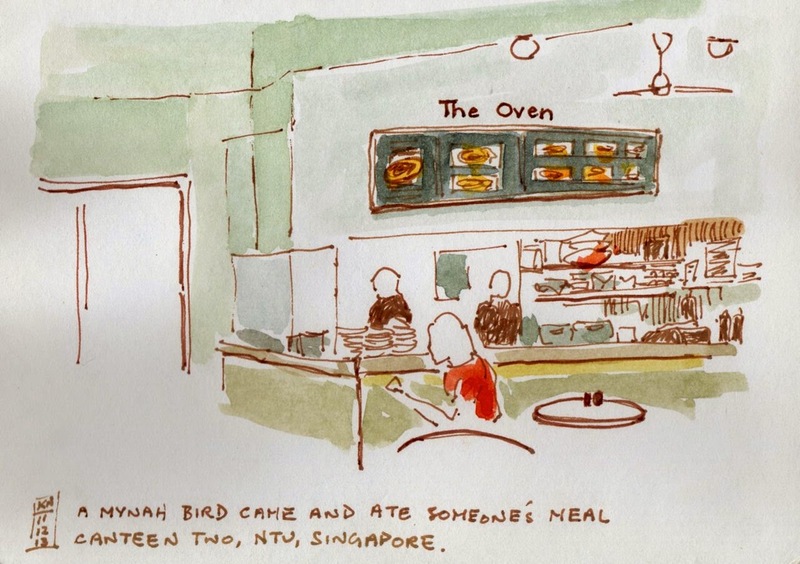 Before going to live in Singapore for 8 months in 2013 I wondered how I would adapt to living there again (as opposed to going there on holidays) and how I would connect with old friends and family. It was a surprise to me how easily I slotted into daily life, strengthened many relationships and made new friends. During that time I was very moved by a book which touched strongly on my own feelings of past and present, the notion of "home" and living between 2 countries. I had the great pleasure of befriending the author Kim Cheng Boey. His book is called "Between Stations". See Review. This is the view looking down from the floor above into a Chinese restaurant called Din Tai Fung in Jurong Point Mall, Singapore. It is just one of about 18 branches of this popular restaurant and is perhaps one of my favourite Chinese restaurants to eat at. It serves tapas type dishes akin to Yum Cha. 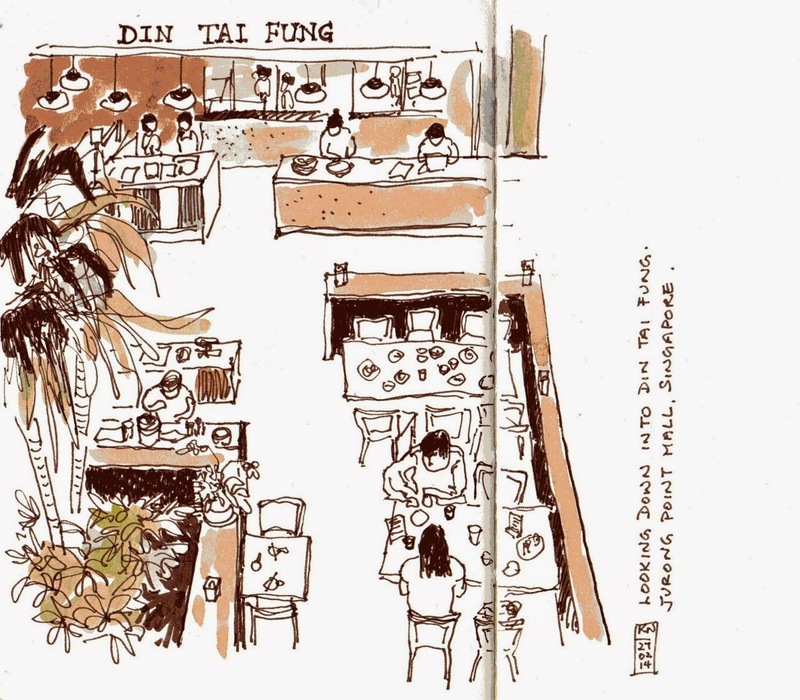 Every Din Tai Fung restaurant has an open kitchen with glass walls so that diners can see the preparation of food. Their signature dish is Xiao Long Bao (little dragon dumpling). Each dumpling is weighed so that each pork filled mouth watering morsel meets the requirement of 20.8 to 21.2 gms! Each dumpling is pleated with a minimum of 18 folds and twisted at the top before being steamed! We had a farewell lunch there with friends before returning to Canada. 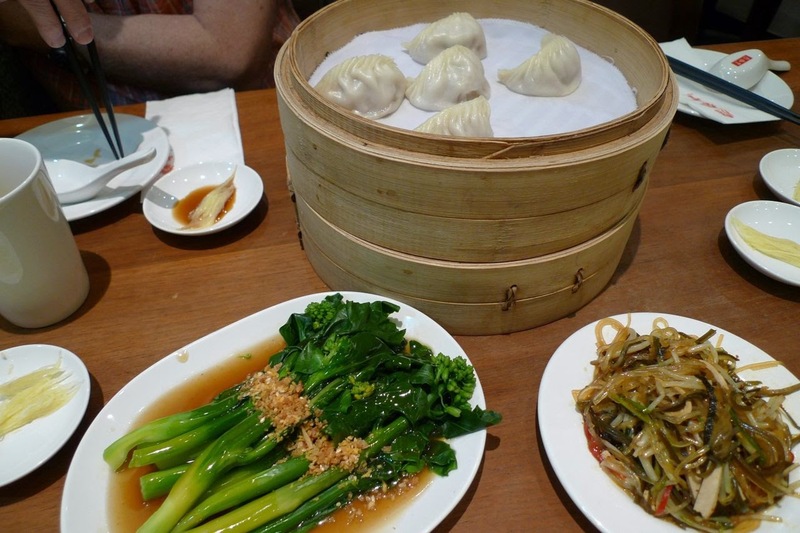 Here's some of what we had for lunch (clockwise) - Xiao Long Bao (in the steamer basket), Oriental Sweet Sour Salad and Kai Lan Greens (Chinese Kale). The yellow strands in the little plates is finely sliced ginger. Din Tai Fung has branches around the world. 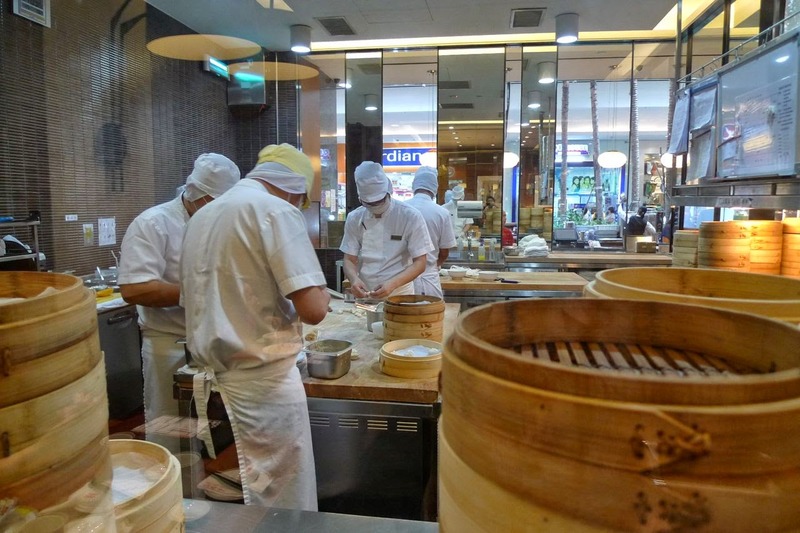 For more on this restaurant and to see photos with a description of their dishes, see Din Tai Fung. 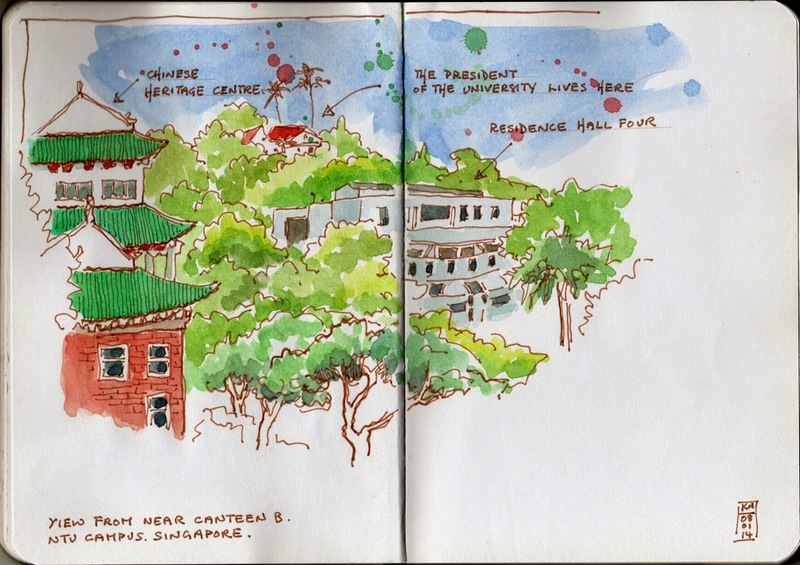 The 8 months we spent living on campus at Nanyang Technological University (NTU), Singapore, was a most positive experience except for having to cope with my phobia of house lizards. 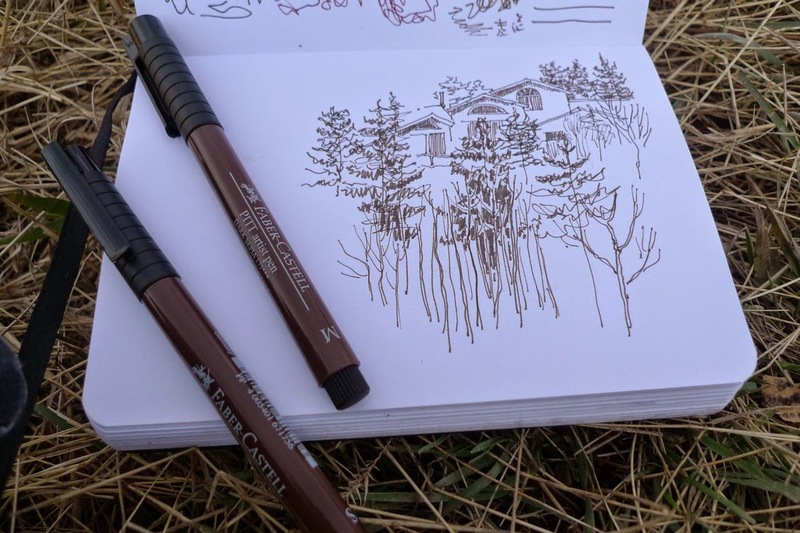 My spouse was teaching and I was sketching and reconnecting with family and old friends. 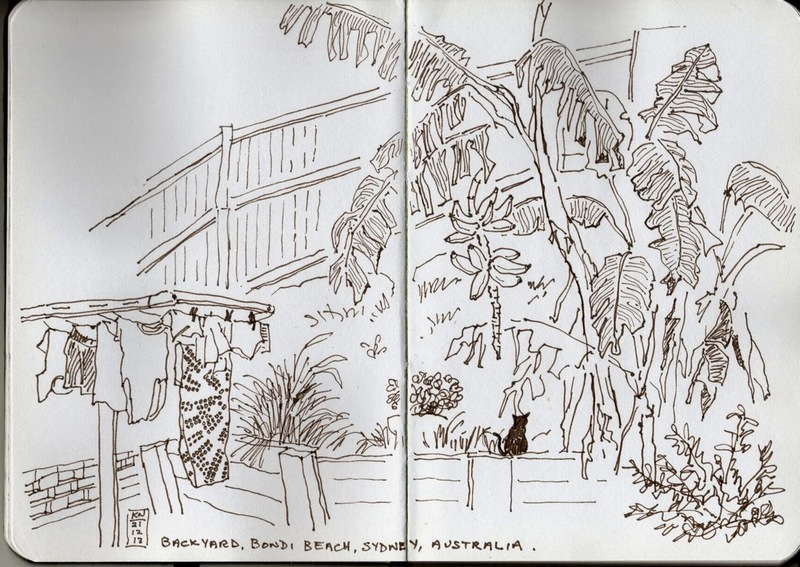 I filled 3 sketchbooks, honed my skills and made many new sketcher friends from several countries. 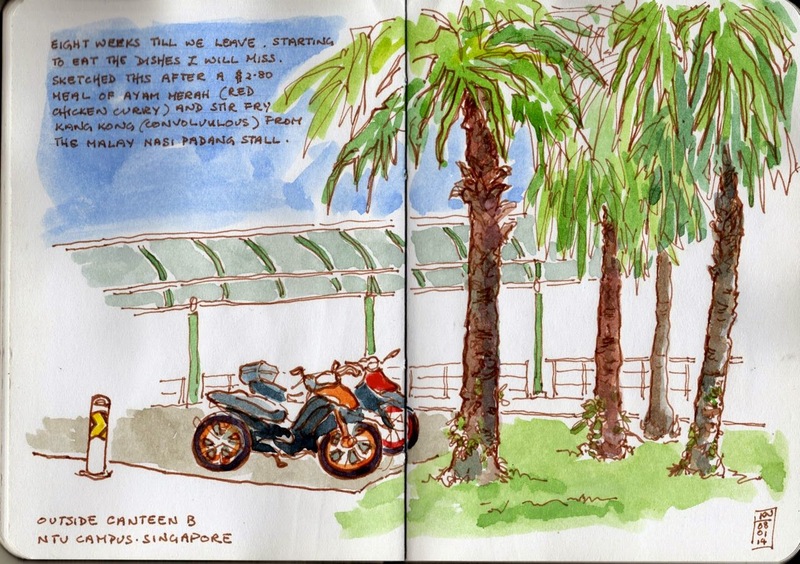 It is the enthusiasm of the members of Urban Sketchers Singapore (of which I became a part of) which has most helped in my development. 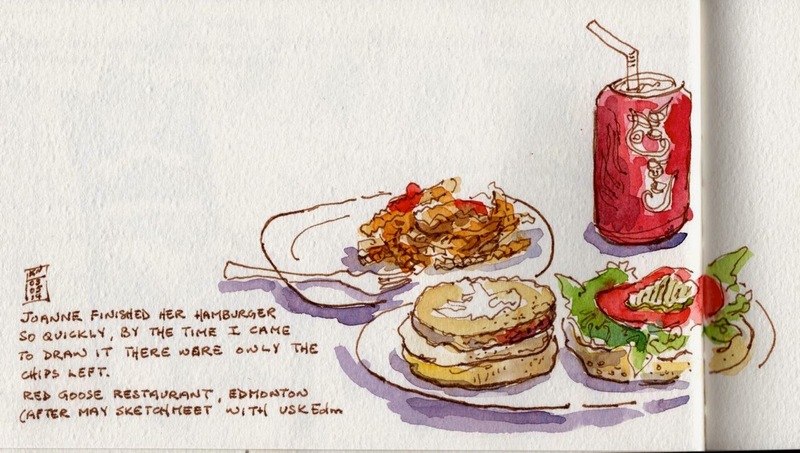 Here are a few sketches done in the last 4 months of our stay. Canteen Two, probably our most frequented canteen just a 5 minute walk from our apartment. Sunday mornings were very quiet, I guess students were still asleep. Faculty families often came for brunch. A mynah bird flew into the canteen and proceeded to eat from an unattended plate of food. It flew out of the room through the automatic doors just before they closed (to great cheers from the breakfast crowd that day). 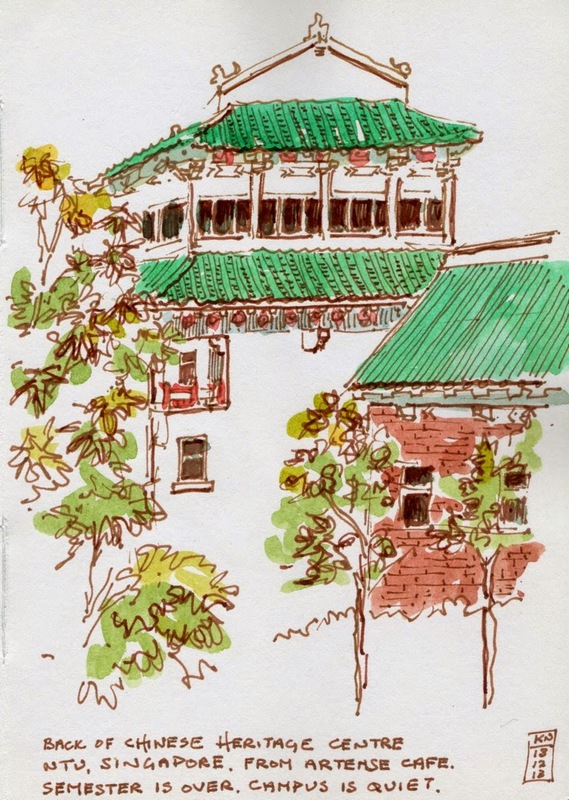 A view of the back of the Chinese Heritage Centre from the upmarket Artese Cafe. 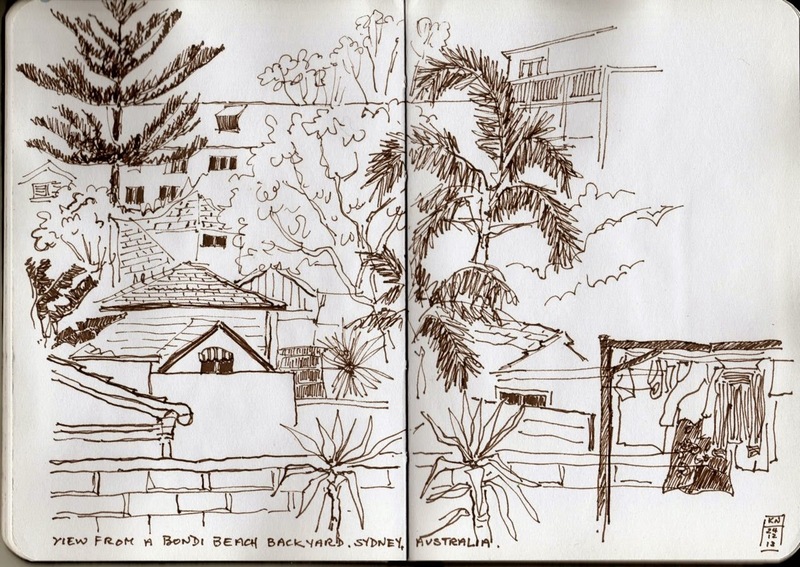 This was a pleasant place to sketch from during semester break when you could be assured of a table to sit at. My favourite drink there was iced wolfberry and red date tea. A view looking down on the bus stop from Canteen Two. Faculty housing in the distance. There are 600 housing units for faculty families on campus. Faculty "families" are defined as including spouses, dependent children and parents. Makes for a nice mixed-age community on campus. (Not forgetting the 10,000 students who live in dorms). Palm trees next to Canteen B. 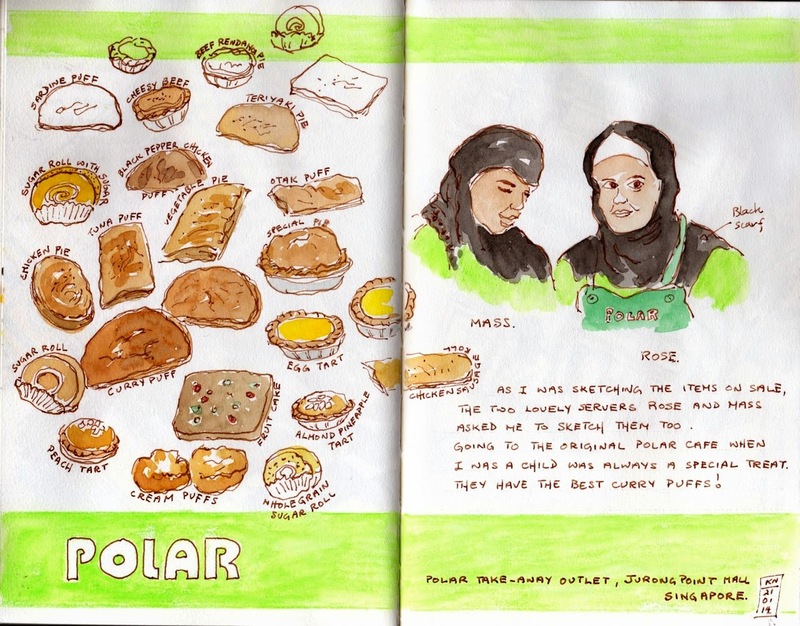 An especially good place for Malay and Indian food. A view looking over part of campus from Canteen B. The President of NTU lived in a house at the top of the hill. With a population of 5.3 million people in an area of 716 square kilometres, Singapore has one of the highest population densities in the world. However, the emphasis on urban greening as a cornerstone of urban development has resulted in Singapore now being called The Garden City. 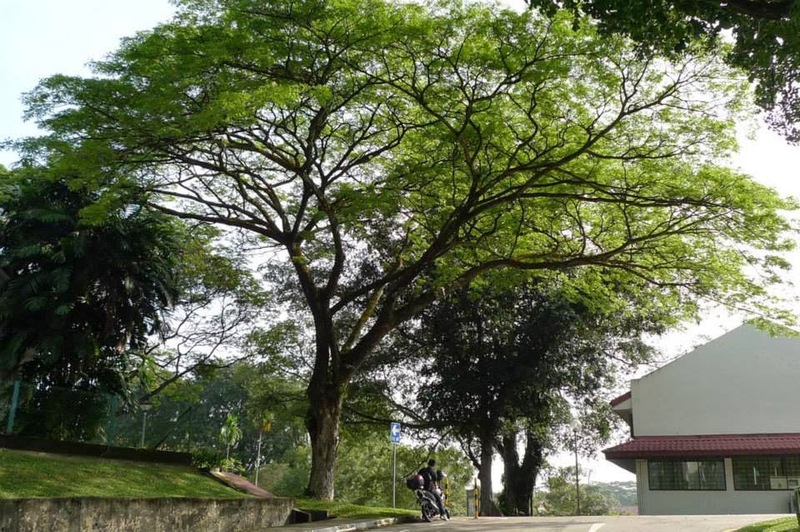 The city is dotted with magnificent old trees and one of my favourites is the Rain Tree (Samanea saman). When it blooms, the crown of this tree is covered in clusters of pinky white flowers. Interestingly, the leaves fold up just before sunset and before rain. This is why it is called the Rain Tree. 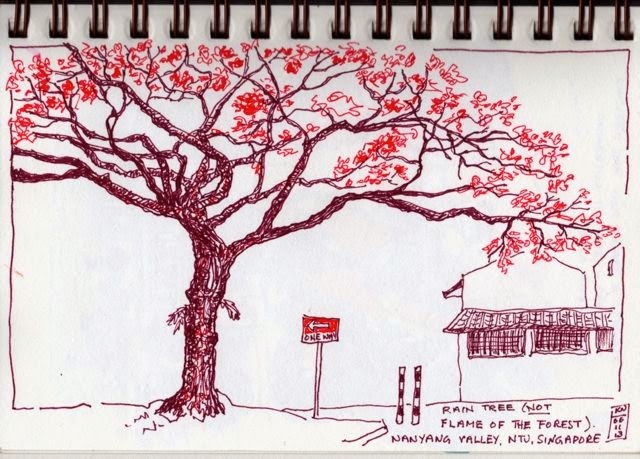 I sketched this Rain Tree which was just a stone's throw from our apartment on the campus of Nanyang Technological University, Singapore. It came with it's own resident woodpecker. The little blighter made a din with it's drumming. The public can now nominate trees to be part of The Heritage Trees Scheme with the objective of conserving mature trees. For me the Rain Tree figures large in my childhood memories of the city. Rain Trees are part of *my* heritage. 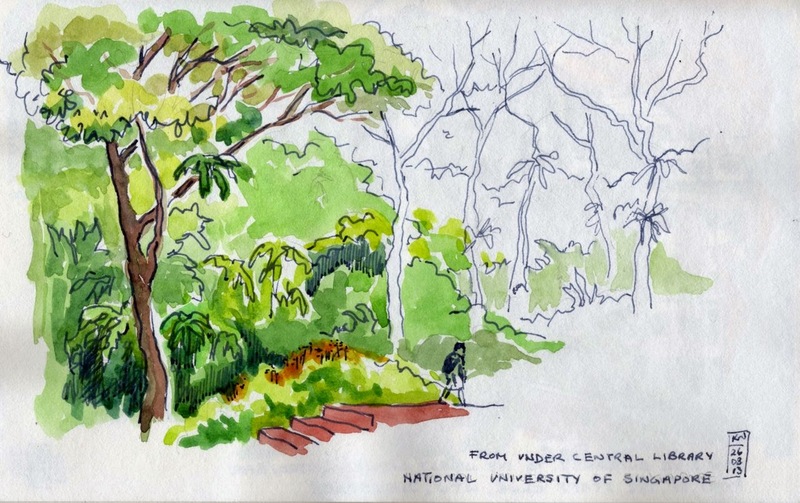 This sketch (including colour) of a grove of majestic Rain Trees was done while I was waiting to have lunch with my niece at The National University of Singapore. 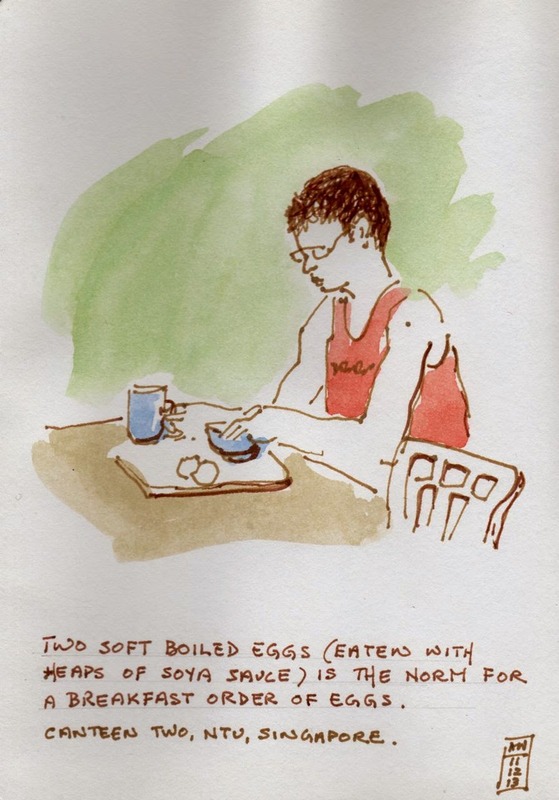 I was trying out my (then) new Daler-Rowney travel watercolour sketch set. Just can't get enough of them! 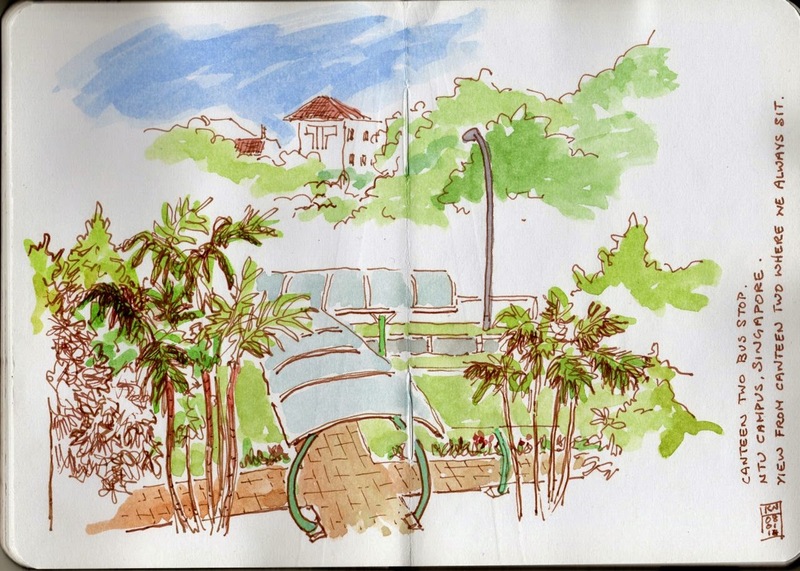 This photo was taken on the campus of Nanyang Technological University where we used to wait for the bus. 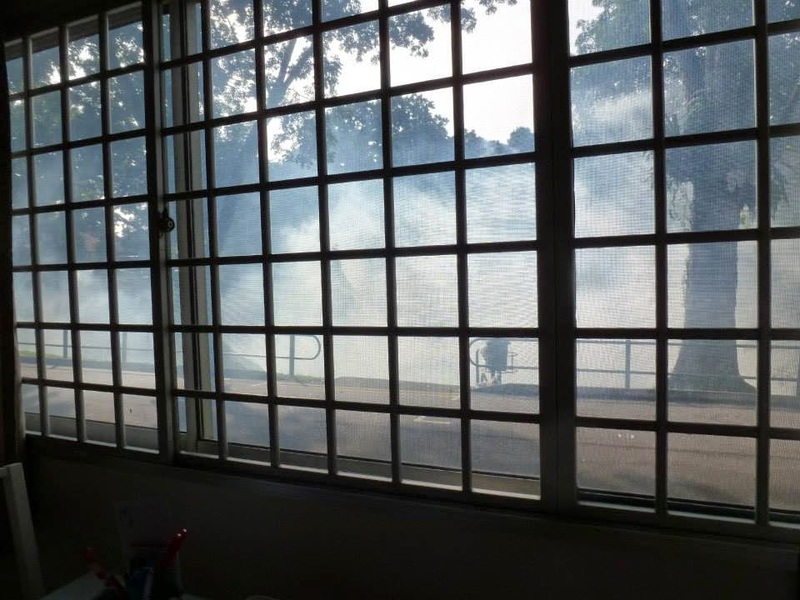 There was always much activity outside our apartment on the campus of Nanyang Technological University, Singapore where we lived for 8 months in 2013/14. 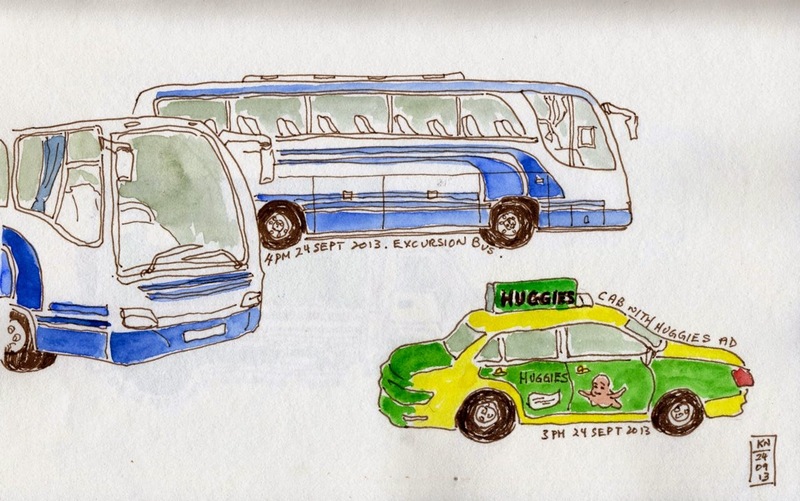 I found it rather enjoyable to watch the comings and goings and to sketch the vehicles and people who came to do their regular chores. Every Wednesday a van from a pest control company parked outside and the driver then fired up a contraption with a huge roar. He then went on foot around the buildings carrying the contraption on his shoulder. It emitted a dense white cloud of strong smelling gas. This was spray to kill Dengue carrying mosquitoes and we would hastily close any open windows and bathroom doors. 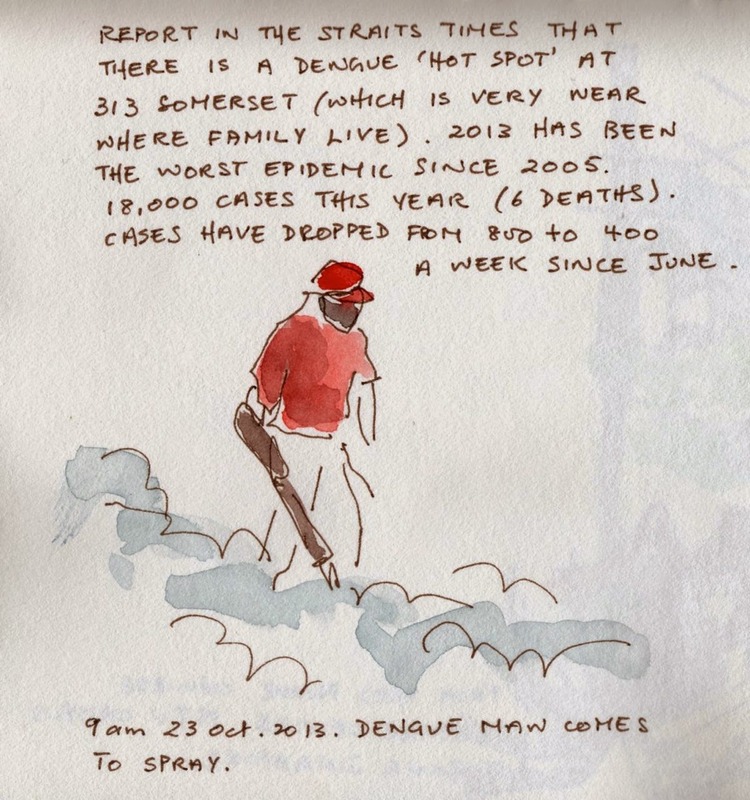 Despite 2013 being the worst epidemic since 2005 with 18,000 cases (and 6 deaths) recorded between January and October that year, in the 8 months we spent in Singapore I saw no more than 3 mosquitoes. Presumably the weekly spraying did it's job in our neighbourhood. View outside our window after the spraying. Much to our annoyance, travel coaches and taxis parked outside every day especially at lunch time. The drivers took themselves off to eat at the cheap student canteen just close by. 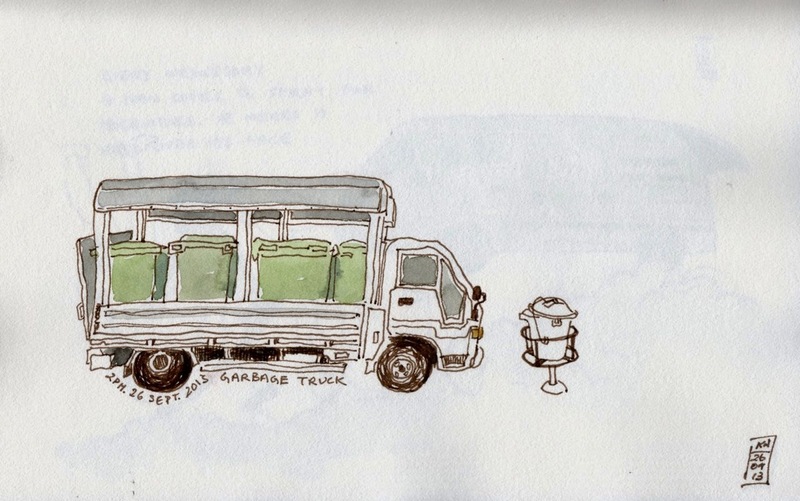 A tiny garbage truck came daily and removed the contents of the tiny garbage bin outside our block of apartments. The bin was always overflowing.